BOSTON, MA -- The Eastern Hockey League Premier (EHLP) is set to host its 2nd showcase of the season this upcoming Sunday and Monday at the Lawrence Valley Forum (Lawrence, MA) and the Chelmsford Forum (North Billerica, MA). The 2-day event will feature all 12 EHLP teams competing in 12 solid matchups. Leading up to the showcase, there are also 3 games in 3 days, starting this afternoon at 2:20pm. We've got a rematch of last year's New England Conference finals. The Rangers won last year's playoff series in the decisive 3rd and final game, and then went on to claim their 2nd title in 3 seasons since the EHLP was formed. Saturday marks the first of 7 meetings between the 2 teams this season, and it's a nice preview before the upcoming 3-game series at Leddy Arena (November 16th through 18th). Below you'll find the full weekly schedule through Monday, and remember, next set of TSR Hockey Stars of the Week will be released following the conclusion of the showcase. 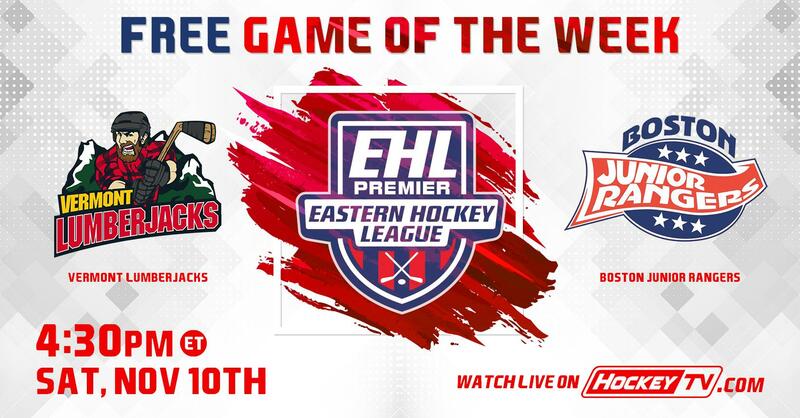 Be sure to catch the #Eshow all season long on HockeyTV.